Find hotel near Rheinische Landesmuseum B .. The Museum Rheinisch-Westfälischer Alterthümer is managed exclusively by the Rhineland Landscape Association.The present day museum has evolved from the “Museum of Antiquities” (Museum Rheinisch-Westfälischer Alterthümer) and the Provincial Museum. Founded in 1820 by the decree of Prussian Chancellor, Karl August von Hardenberg, the museum houses many ancient figures dating back to the Roman era. It has numerous collections of archaeology and art in Nordrhein-Westfalia. Apart from the exhibitions, the museum also hosts events and cinema shows inside the auditorium. Subject areas of the museum also display literature exhibition catalogues, trade publications and gift gallery. The museum hosts guided tours for children during holidays. Family Day is celebrated on special occasions. It is a conference venue for political and economic groups. It may get crowded at times. It is a great spot to catch-up with press conferences, book releases and literature workshops. Cinema shows are organized projecting foreign films. Don’t click photographs without permission. Parking for handicapped with railed ramp is available. Borrowed wheelchair services are available. Scholarly demonstrations are conducted during the day time. Maintain silence and ensure that the kids don’t trespass into restricted areas. Children below 18 years: Free of cost. Group tours for school children: 10 am- 6 pm. 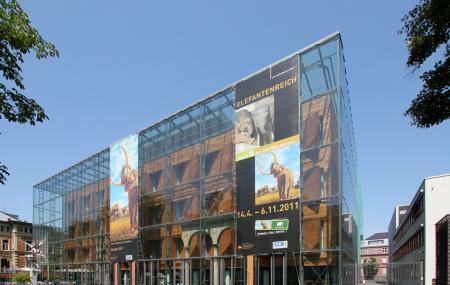 How popular is Rheinische Landesmuseum Bonn? People normally club together Deutsches Museum Bonn and Arboretum Park Haerle while planning their visit to Rheinische Landesmuseum Bonn. Very cool place. We went for the knights and castle exhibit. 20 euros for two adults and a kid. Enough to look at. Some in English and German and also Dutch. Cafe attached. Right near main train station. Kids loved it. Activities for them to do. Another Landesmuseum of outstanding quality. The Roman collection is superb but it's the early mediaeval collection which makes it worth going out of your way to visit. The "Lord of Morken" exhibit is particularly impressive. There is also a very good bookshop, something it is frequently lacking in museums both in Germany and elsewhere. The museum is a little boring. There are many pictures, statues, small objects, but not too much information. I haven’t got the way they organized the exposition, periods are all messed up. Perhaps it’s me who went a wrong way. But I liked the temporal exposition consecrated to the medieval knights. Fascinating artifacts and art works dating from pre-history to modern day. The museum is strangely laid out and all information is in German language only. I looked at everything on four floors and it took me about 2.5 hours, so don't plan an entire day for your visit. Definitely worth the time!